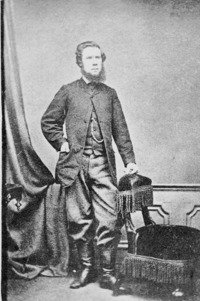 WHELAN, PATRICK JAMES, tailor, convicted of the murder of Thomas D’Arcy McGee; b. c. 1840 in Ireland, younger son of William Whelan and Mary Sullivan of Galway; m. 13 Feb. 1867 at St Patrick’s Church, Montreal, Bridget Boyle, daughter of Donald Boyle and Catherine Twite of Kerry (Republic of Ireland), and they had no children; publicly hanged in Ottawa, 11 Feb. 1869. Patrick James Whelan was apprenticed to a tailor at age 14. About 1865 he came to Canada and worked for Vallin, a tailor in Quebec City. He also joined the cavalry volunteers. He was later employed as a tailor by Gibb and Company in Montreal, and after November 1867 by Peter Eagleson, a tailor in Ottawa. He was skilled at his trade, and fond of horses, shooting, dancing, and drink. When Thomas D’Arcy McGee was killed in Ottawa by a .32 calibre bullet on 7 April 1868, the assassin was immediately assumed to be a Fenian. Rumours of further Fenian terrorism became rampant, and the Habeas Corpus Act was suspended. Within 20 hours of the murder Whelan was arrested. In his pocket police found a fully loaded .32 calibre Smith and Wesson revolver. More than 40 other suspects were jailed, including Patrick Buckley, Sir John Alexander Macdonald*’s cabman. On 9 April Whelan was charged with the murder. An appeal was made to the Court of Queen’s Bench of Ontario. Richards, who had in the meantime been named chief justice of the court, cast the deciding vote in the court’s two to one decision against the appeal in December. 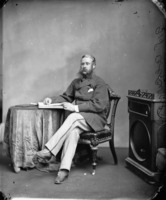 The case was carried further, and in January 1869 Richards again cast the decisive vote when the Ontario Court of Appeal, which included the three justices of the Court of Queen’s Bench, rejected the appeal by six to four. On 11 February, Whelan spoke from the scaffold to more than 5,000 spectators. He met his death with manliness and faith. Within five months the law was changed to ban public hangings in Canada. The other suspects were all released or speedily acquitted, including Buckley, who returned to Macdonald’s employ. No proof was ever found that Whelan was a Fenian or that he had had an accomplice. In October 1973 Whelan’s revolver was located after being lost for a century. Tests were conducted by ballistics experts but with inconclusive results. There is room for doubt that Whelan was actually the assassin. The identification made of him at the scene of the crime can be discredited, and his trial and the rejections of his appeals were marred by bad procedure. He always denied that he had fired the shot but he admitted just before he was hanged that he did “know the man who shot Mr. McGee.” The case is still shrouded in mystery. George Spaight, Trial of Patrick J. Whelan for the murder of the Hon. Thos. D’Arcy McGee . . . (Ottawa, 1868). T. P. Slattery, “WHELAN, PATRICK JAMES,” in Dictionary of Canadian Biography, vol. 9, University of Toronto/Université Laval, 2003–, accessed April 24, 2019, http://www.biographi.ca/en/bio/whelan_patrick_james_9E.html.